Carpet adds a lot to a room, colour, comfort, warmth, and a symbol of style and taste. They have become a central feature in our homes. With all these advantages, they have one disadvantage, they must be professionally cleaned on a regular bases. If you don't they get stained and can absorb unpleasant odors. The longer you wait the carpet my appear worn and discoloured. That's why carpet manufacturers recommend the carpets be professionally cleaned every 6 months to 1 year to maintain warranty and extend life. Cleaner, longer-lasting carpets starts here! Getting Ready: There are a few things you need to prepare for our arrival. We ask that you remove any fragile or valuable items from the areas being cleaned. Clear all access walk ways and please remove your vehicle from the driveway that is closest to the access door. On Arrival: We conduct a pre-inspection of the areas or items being cleaned, at which point we ask the customer to point out any major stains or areas of concern. Our service technician will then pre-spray all areas being cleaned at which point he will pay special attention to areas that the customer has pointed out. Upon Completion: While our powerful, truck-mounted vacuum system removes almost 90% of all the moisture immediately, your carpet or upholstery will still feel damp. Using fans in any areas cleaned and turning on your furnace fan can help to accelerate drying time. We ask that you don't move any furniture around until the carpet and/or furniture is completely dry to avoid colour transfer and stretching. You may walk on your carpet immediately after cleaning but avoid wearing anything with dirty bottoms, as they will re-soil your carpet. 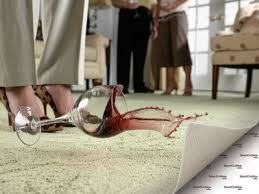 Also be careful when walking from damp, carpeted areas onto hard flooring to avoid slipping or falling. Before leaving our cleaning technician will do a walk through with the customer to ensure all areas are done to the customer satisfaction. We pride ourselves on doing it right the first time. We also offer: Carpet Deodorizer which helps to neutralize cooking, foot and pet odor. Kill 99.5% of all organic smells. Deep Machine Scrub for the areas that require a lot more attention. Carpet Protection(Scotchgard) Helps to protect the carpet fibers, which keep them cleaner, brighter and fresher for longer.